Tilted Horizons: Rossi Wins MotoGP Championship (Yup, Again)! Rossi Wins MotoGP Championship (Yup, Again)! 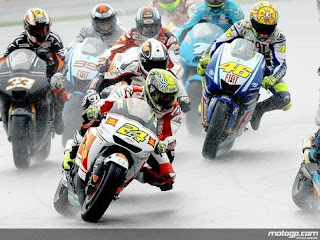 Valentino Rossi clinched his 9th world championship (7th at the premier level) last Sunday at the Malaysian GP at Sepang, overcoming an awful first corner and clawing his way in the wet to an eventual 3rd behind Casey Stoner (who cleared-off early) and Dani Pedrosa. Teammate Jorge Lorenzo, the only racer with a real chance to steal the championship from Rossi, came home in 4th. With one race to go, Rossi has an insurmountable lead. 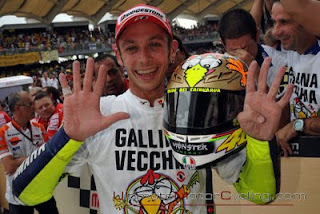 After taking the checkers, Rossi treated his fans to another of his patented victory celebrations, this one complete with a live helmeted chicken, a large egg with "9" printed on it, and a victory lap in a t-shirt bearing the Italian phrase akin to "Old Hens Make Good Soup" or "Old Hens Lay Good Eggs"....or something like that. I believe it's a comment on the "old man" Rossi (at 30!) besting his young competitors; it probably makes sense if you're Italian. Vale (46) mired around 9th place early on. That's championship #9 in any language.